Rushkoff brings the prophetic tradition to comics with his first and widely acclaimed graphic novel series for Vertigo, retelling the Bible as a near-future global conflict over currency and reality itself. Humans and gods struggle to dominate a mythic and relevant narrative both within the panels and between them. 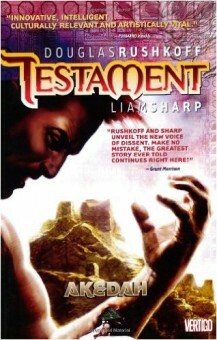 The full series of Testament is now available in a single digital omnibus.